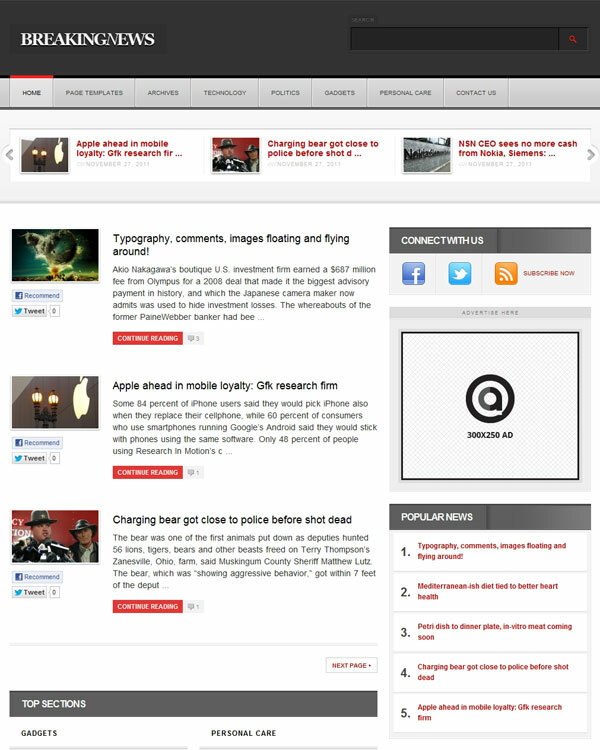 Acosmin BNEWS is the perfect theme for websites related to news especially breaking news. The theme is designed in such a way so that you content is highlighted to the maximum. Some of the features of Acosmin News theme include image slider, social sharing button, Facebook fanpage integration, custom page templates, threaded comments, WordPress 3.0 menu, 5 different colour schemes, major browser compatibility, and much more. The homepage is designed in the simplest way possible so that when the user is working with Acosmin News theme then they don’t need any coding to design their homepage. To suit the theme according to the latest website creation trends, jQuery image slider is provided with this WordPress theme. With the help of this slider you can create beautiful videos, image, and normal slides to give your website a better look and feel. The slider can be easily customized to suit your website’s purpose and for this you don’t require any special coding skills. You can create a slider of your daily news headlines which will make it easy for the readers to read the current news as well as view its images also. This theme comes with five different colour schemes and that is in blue, red, orange, light blue, and pink. You can use any of the colour schemes to make your news related website look more attractive. This feature will help you to customize your page template easily. Moreover, for every page you can choose a different page template thereby giving a refreshing look to your website. The page templates which you will get with Acosmin News by default are blog with normal posts, archives, blog template, and full width pages. If you want then you can include new page templates like links, and so on. For every post detail page, the Acosmin News wordpress theme offers social sharing button which is a great SEO related feature. This feature allows you to include social media profile buttons in the sidebar of you page. Here you can add the Facebook’s Like button, Share button, Twitter’s Tweet button, and so on. One of the powerful SEO related features offered by this theme is Facebook Fan page integration. With the help of this feature, you can include the URLs of your fanpage thereby promoting your fan page and getting more Facebook likes and worldwide exposure. You can also use it as a business strategy to charge those fan pages which you are promoting on your news related website. For all types of ads whether they are normal or classifieds, you can use this advertisement management feature to manage Ads efficiently and earn money online. The news related websites can setup advertisements like Google Adsense, Banner Ads, Affiliate Ads, and so on. For Ad managing, the theme provides some plugins which will help you in doing your Ad business better. With the help of this threaded comments feature, the users can easily be connected to their reader and can quickly interact with them. Moreover, they can also keep records of their conversation and can set the number of levels for the conversations to take place. With the help of Auto post resizing feature, the posts will be resized according to their size. The users will not have to crop or fix it to a particular size because all this will be done automatically by the theme. Valid CSS/HTML code is used for creating the theme and hence you will get a powerful website as the final result of using this theme. Moreover, the codes are very easy but the users will not be required to work with the code because the features are very easy to use. The SEO features are optimized in such a way so that they can work well with all types of browsers perfectly and give the desired results. Moreover, the features will help to grab web traffic to your website thereby increasing its ranking in various search engines. Not only the SEO features but the complete theme supports all types of browser compatibility. The news related website created using this theme will load and run efficiently on all browsers be it the Internet explorer, Firefox, Chrome, Safari, Opera, or any other browser. The Acosmin News theme supports the theme Admin option panel where you can create your own option panel using the different customization functions available there. The theme provides sidebars for posting Ads. This feature will help you to make good money by Ad posting and so on. This feature allows users to customize their menu according to the needs and requirements of their website. Moreover, the users can add categories, pages, etc from the options panel. Once the users will purchase this Acomin News theme, they will get regular theme updates for their lifetime. Moreover, the great customer support system will also be free for them. The users will get some in-built Photoshop files with this theme package. The powerful and easy to customize features offered by this Acosmin News theme makes it one of the best themes which can be used for creating a news related website. Moreover, the Ad spots will help the users to make good profit by posting Ads. With the help of SEO related features, your website will get extensive promotion, advertisement, and high search engine ranking as well. The jQuery features makes the website look more lively and attractive. The loading speed of the website may get affected when it contains lots of images or data. Some customization features are not very easy to perform and they may require some extra coding skills. This drawback decreases the theme’s usability among the beginners or no coding skills professional for example purely designers.